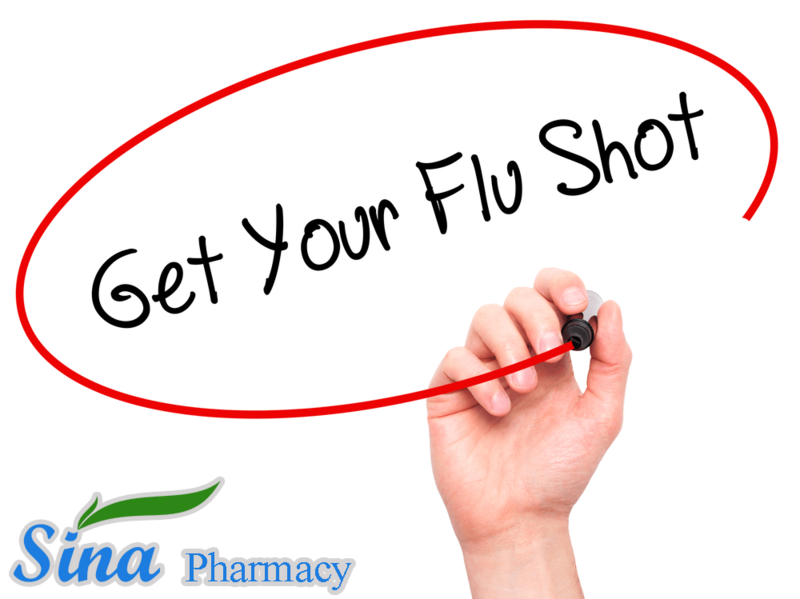 Sina Pharmacy is committed to helping you stay healthy and getting the flu shot is your best defense against the flu. Our pharmacists can immunize you with a flu shot any time, any day (no appointment necessary, but if you do not want to wait longer you can make your appointment by filling out the form provided). When you check-in at the front desk, all you need is your provincial health card (Care Card). Please note that by BC provincial legislation, Pharmacists cannot administer a flu shot to children under 5 years of age. How to book your appointment: 1. select "Flu Shot Vaccination" from the Service tab below, 2. choose the appointment date and time, 3. provide your personal info, and 4. submit the data. Reduce your risk and get your flu shot --- All you need is your provincial health card & 15 minutes of your time. Each year in late fall and through the winter, flu strikes. Influenza, commonly known as the flu, is a common, highly-contagious respiratory infection that affects the nose, throat and lungs, and makes you feel quite ill. Symptoms usually last about a week to 10 days. The flu is not like a common cold. It is a serious infection especially in infants, seniors and in people who have other medical conditions such as diabetes, anemia, cancer immune suppression, HIV or kidney disease. The main differences are shown in the table below. The Public Health Agency of Canada and the US Centers for Disease Control both advise that the best way to protect yourself from the flu is to get an annual flu vaccine in fall. Since the virus causing the flu changes from year to year, the flu vaccine you received last year may not protect you this year. If the vaccine and the flu strain are a good match, the vaccine can prevent the flu in about 70%-90% of healthy children and adults. Approximately 3-7.5 million Canadians will get the flu in any given year. What influenza viruses does this season’s vaccine protect against? What are my vaccine choices this year? The public vaccines will be available at no charge for eligible patients. In BC, the influenza vaccine is provided free to people who are at high risk of serious illness from influenza (such as young children, pregnant women, the elderly and people with certain medical conditions) and those able to transmit or spread influenza to those at high risk. For a list of people eligible for the free inactivated influenza vaccine, see the HealthLinkBC File: Inactivated Influenza (Flu) Vaccine. For a list of people eligible for the free live attenuated influenza vaccine (given by nasal spray), see the HealthLinkBC File: Live Attenuated Influenza (Flu) Vaccine. Anyone not eligible for a free influenza vaccine can receive it privately. What should I do after my flu shot? • Remain within the building for at least 15 minutes. The pharmacist needs to watch you to see how you react to the flu shot. It is most likely that you will be fine, but a very small number of people can have a reaction that the pharmacist will need to treat with a drug immediately. • If you feel faint or short of breath, or experience chest tightness, inform the pharmacist. • In extremely rare instances, an allergic reaction may occur. The pharmacist is prepared to handle this. What are some possible side effects following the flu shot? Exercising the arm or applying a cold pack later in the day will minimize the discomfort; if necessary take ibuprofen or acetaminophen to ease the pain. Symptoms may start 6-12 hours after the flu shot. If any of these symptoms do not go away in 1-2 days or get worse see your doctor. If any of these symptoms occur, you could be having a severe reaction to the vaccine. This is a medical emergency! Call for HELP! Go to the nearest emergency clinic. Report any reactions to your doctor. No. In order to offer you the most effective protection, the vaccine must contain part of the virus itself – the virus is dead and cannot give you the flu. Can women who are pregnant or breastfeeding get the flu shot? Influenza vaccine is considered safe and may be beneficial for pregnant women at all stages of pregnancy and for breastfeeding mothers. Speak to your health care professional for further information.